Miami's Baseball program has seen many great players, but none came to Mark Light Stadium with more expectations, or accomplished more than Pat Burrell! The 1995 California Coaches Player of the Year at San Jose's Bellarmine Prep School, he was the 43rd pick in the MLB draft by Boston, but chose Miami over the Red Sox, and Hurricane fans are grateful he did. His 1996 season was one of the best in college baseball history. He hit a home run in his first game in Orange, Green and White and tallied 5 in his first 6 games. He became the first Freshman in NCAA history to lead the nation in hitting with a .484 batting average. He totaled 23 home runs and 64 RBI's as the Canes advanced to the Championship Game of the College World Series, where he became only the 3rd player ever to win the CWS' MVP award when his team did not win the title. He was named a 1st Team All-American by Collegiate Baseball and Baseball America. The third baseman followed that with 21 home runs, 76 RBI's and a .409 average in 1997, once again winning All-American honors. He toured with Team USA, hitting 12 homers in 34 games and was named Summer Player of the Year by Baseball America. 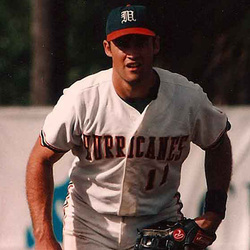 In 1998, Pat missed 38 games due to a back injury, but still compiled 17 HR's with 47 RBI's with a .432 average, leading the Canes to the CWS for the 3rd straight year. He became the only Hurricane to win the coveted Golden Spikes Award, presented by USA Baseball as the nation's Top Amateur Baseball Player! His .886 career slugging percentage ranks 2nd all-time in NCAA history, and his .442 career batting average is 7th all-time, both school records. In the U.M. record books, he is 2nd in career home runs (61), 2nd in total bases (465), 5th in RBI (187), and 4th in walks (170). The Philadelphia Phillies made Pat the #1 overall pick in the 1998 Major League Baseball draft. He joined the big league club in 2000, finishing 4th in Rookie of the Year balloting. He was co-winner of the 2005 Mike Schmidt Phillies MVP Award. In 2007, he joined Schmidt and Bobby Abreau as the only Phillies players in history to hit 20 Homers in 7 consecutive seasons. In 2002, he established "Burrell's Buddies", providing tickets to youth groups that show outstanding character. Pat and his wife, the former Michelle Fonseca, were married November, 10, 2007 in California.